Coban Rondo Waterfall is one of the best destination in Batu Malang City of East Java, Indonesia. Coban Rondo waterfall located at Pandesari village, Pujon district of Batu City. Coban Rondo waterfall has a height of 84 meters it looks mighty by pouring so much water. In the rainy season, waterfalls flow of 150 liters per second, while during the dry season the water discharge 90 liters per second an altitude 1,135 metres above sea level. 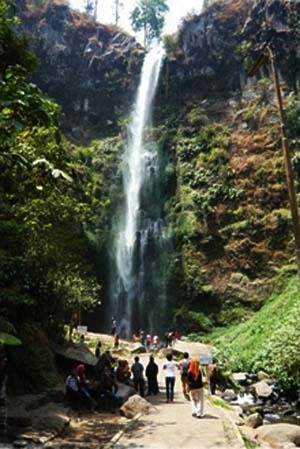 Coban Rondo Waterfall Batu Malang is one of the main attraction has been as a part of Malang City Tour. Most visitors take the combination trip between Mount Bromo and Malang City tour that cosist of BNS (batu night spectacular), Paragliding Tour Malang, Selecta Flower Garden, Jatim Park, Omah Kayu (Tree house at Malang), Jodipan, Omah Warna Warni, Taman Langit, Coban Rais and still more not mentioned. On the top of this waterfall streaming of twin waterfalls, named Coban Manten which coalesced into Coban Dudo Waterfall and flows down into Coban Rondo. The third source of waters located above Coban Manten that huge of a treeless plains. To get Coban Manten, still need an extreme struggle for the slippery terrain and far distance about 3-4 kilometres because still not built the main route. This tourism object have same spectacular views like Madakaripura Waterfall and Tumpak Sewu Waterfall Lumajang. Coban Rondo Waterfall Batu Malang derived from the name Coban (waterfall) and Rondo (widow). wherein, a pair of newlyweds named Goddess Anjarwati and Raden Baron Kusumo who desires to travel to her husband resident at Mount Anjasmoro. The conflict began, when Goddess Anjarwati opposed her parents prohibition to leave out everywhere because their marriage age still young or just entering Selapan (36 days in discussing Java). Because they insisted their parents prohibition, Eventually the danger was found in the middle of the road and suddenly they met with Joko Lelono that interested in Goddess Anjarwati beauty, Joko Lelono wished to grab Goddess Anjarwati from her husband Raden Baron Kusumo by long fight between both of them were inevitable. then Raden Baron Kusumo ordered his soders to hide Goddess Anjarwati in a Coban (waterfall) due to Raden Baron Kusumo not appeared anymore, Eventually he was known that Raden Baron Kusumo was passed away and let Goddess Anjarwati as a widow (Rondo). finally this waterfall called the Coban Rondo. Air Terjun Coban Rondo has temperature 20-22 degree centigrade, fresh air and cold water will be felt after arrive in waterfall area because this waterfall settled in Panderman Mountain. to get this waterfall just trekking for 15 minutes from parking lot and 10 minutes from the entrance gate by car. In parking area, there are many typical fruit has been sold for visitors such as Apple,Orange, Banana and various local food stores and Souvenirs as well. this nature tourism provide complete facilities such as Outbond, Camping Ground that usually used as camping, high rope corset, tracking line flying camp and Photo Service. Coban Rondo Waterfall Batu Malang is one of the nature tourism part located in Batu City of Malang, This place already visited by huge foreign and domestic tourist. Coban Rondo Waterfall tourism is suitable visited after finish enjoy Mount Bromo tour package. If You need other combination nature tourism in East Java, You can read detail tour package below. Detail information about Coban Rondo Waterfall tour, Mount Bromo tour package and other nature tourism package around Malang and East Java Island, You can visit Our Contact.